As we age, many people see sagging in the middle of the face as well as deep creases below the lower eyelids and along the nose to the corner of the mouth. Fat may fall or disappear, loss of skin tone in the lower face can create jowls, and loose skin and excess fatty deposits under the chin and jaw can give the appearance of a double chin, even for a person of normal weight. A Facelift, or Rhytidectomy, is a surgical procedure that improves visible signs of aging in the face and neck. If the appearance of your face doesn't properly reflect your youthful outlook on life, a facelift at Hedden & Gunn Plastic Surgery can give you a firmer facial appearance with natural results. The renowned Birmingham, Alabama plastic surgeons at our cosmetic surgery center take special pride in designing each facelift procedure to refresh your look while preserving the natural contours of your face. We carefully listen to the unique goals of each patient so that we can make you feel more confident and attractive. Healthy people who do not have medical conditions that impair healing. People with a positive outlook and realistic expectations. Rejuvenation procedures typically performed in conjunction with a facelift are a Brow Lift to correct a sagging or deeply furrowed brow and Eyelid Surgery to rejuvenate aging eyes. Procedures that can enhance the outcome of a facelift include Facial Implants, Fat Transfer, Skin Resurfacing and injectable Wrinkle Fillers. Nonsurgical facial rejuvenation treatments cannot achieve the same results as a facelift, but may help to delay the time at which a facelift becomes appropriate. They can also be used to complement the results of surgery. By choosing a member of the American Society of Plastic Surgeons (ASPS) for your facelift procedure, you can be assured that you are choosing a highly-trained, board-certified plastic surgeon. ASPS Member Surgeons must meet rigorous standards for training, ethics, physician practice and research in plastic surgery. Discuss the likely outcomes of a facelift and any risks or potential complications. Be sure to ask questions at your consultation. It is very important to understand all aspects of your facelift. It's natural to feel some anxiety, whether preoperative stress or excitement about your anticipated new look. Don't be shy about discussing these feelings with your plastic surgeon. The decision to have facelift surgery is extremely personal. You will have to decide if the benefits of a facelift will achieve your goals and if the risks and potential complications of a facelift are acceptable. Poor wound healing and skin loss. Facial nerve injury with weakness. Temporary or permanent hair loss at the incisions. Sutures may spontaneously surface through the skin, become visible or produce irritation that requires removal. Unsatisfactory results may include asymmetry, unsatisfactory surgical scar location and unacceptable visible deformities at the ends of the incisions. It may be necessary to perform an additional surgery to improve your results. Fibrin sealants (made from heat-treated human blood components to inactivate virus transmission) are used to hold tissue layers together at surgery and to diminish post-operative bruising following surgery. This product is produced from donor blood plasma that is carefully screened. Cardiovascular and general surgeons have used fibrin sealants in their procedures for many years. This product is thought to be of help in diminishing surgical bleeding by adhering layers of tissue together. What to do on the night before and morning of surgery. The use of anesthesia during your facelift. A facelift may be performed in an accredited office-based surgical facility, licensed ambulatory surgical center or hospital. Be sure to arrange for someone to drive you to and from surgery and stay with you for at least the first night. Anesthesia choices for facelift surgery include intravenous sedation and general anesthesia. Your doctor will recommend the best choice for you. Depending on the degree of change you would like to see, your facelift choices include a traditional facelift, a limited incision facelift or a neck lift. A traditional facelift incision often begins in the hairline at the temples, continues around the ear and ends in the lower scalp. Fat may be sculpted or redistributed from the face, jowls and neck. The underlying tissue is repositioned and the deeper layers of the face and the muscles are commonly lifted. Skin is redraped over the uplifted contours and excess skin is trimmed away. A second incision under the chin may be necessary to further improve an aging neck. The incisions are closed with sutures or skin adhesives. The incisions for an endoscopic subperiosteal facelift are placed inconspicuously in your mouth and temple. During the procedure, the fat pads of your cheeks are repositioned up and over the cheekbones where they belong. This redraping improves the nasal furrows caused by drooping fat pads. An endoscopic subperiosteal facelift is frequently performed in conjunction with Eyelid Surgery or a Brow Lift for optimal results. Most patients experience a minimal amount of discomfort following an endoscopic subperiosteal facelift. 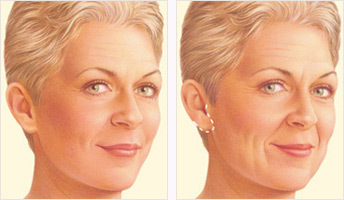 The benefits of this facelift includes no visible incisions, minimal scarring, less bleeding, no hair loss, minimal numbness and a much quicker recovery compared to traditional surgical techniques. After your procedure, a bandage may be placed around your face to minimize swelling and bruising. Thin tubes may be present to drain any excess blood or fluids that collects under the skin. It is important that the surgical incisions are not subjected to excessive force, abrasion or motion during the time of healing. Avoid wearing any clothing that must go over your head. Be sure to ask your plastic surgeon specific questions about what you can expect during your facelift recovery period. After a facelift, it may take a few months for swelling to fully dissipate and for incision lines to mature. 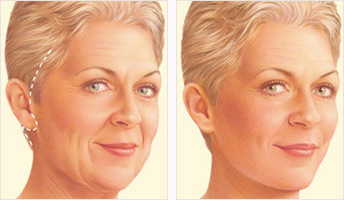 The visible improvements of a facelift appear as swelling and bruising subside. Once healed, the incision lines are well-concealed within the hairline and in the natural contours of the face and ear. Your final result should not only restore a more youthful and rested appearance, but also help you feel more confident about yourself. Life-long sun protection and a healthy lifestyle will help to extend the results of your rejuvenated appearance. Although good results are expected from your facelift, there is no guarantee. In some situations it may not be possible to achieve optimal results with a single procedure and another surgery may be necessary. Nasolabial fold: Deep creases between the nose and cheek. Rhytidectomy: Also known as facelift, a surgical procedure to reduce sagging of the mid-face, jowls and neck. Facelift with the Alabama plastic surgeons at Hedden & Gunn Plastic Surgery can give your face a firmer appearance with natural results.